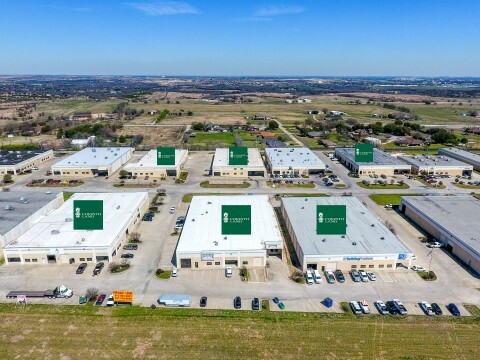 FORT WORTH, Texas--(BUSINESS WIRE)--Marking their second acquisition of buildings in the IH-20 West Business Park (west of Fort Worth just miles from the Walsh Ranch development), Corinth Land and PCI now own six of the 30 Business Park’s buildings. This latest acquisition includes 72,476 SF that encompasses 6676, 6701 and 6715 Corporation Parkway which are all 100 percent occupied. Wilks Heritage Group, LLC was the seller and one of the tenants is well-known Schaefer Outfitter. The purchase was financed by Simmons Bank, directed by Becky Carlton, with equity provided by Fort Worth-based Investors Royalty Inc., an affiliate of Corinth Land Co.
For more information, visit www.corinthland.com or www.prattcocreekway.com. Marking their second acquisition of buildings in the IH-20 West Business Park, Corinth Land and PCI now own six of the 30 Business Park’s buildings.